Manchester United defender Axel Tuanzebe has completed a loan move to Championship side Aston Villa for the remainder of the 2017-18 season. The 20-year-old has made three appearances for us so far this season – 18 minutes in the Champions League, a stoppage time appearance in the Premier League and the full 90 minutes of our EFL Cup win over Swansea City back in October. Opportunities have been limited at United for the versatile youngster with Antonio Valencia the first choice right-back being very fit. Ashley Young, Matteo Darmian and Victor Lindelof have all been used in his position this season too. Axel Tuanzebe will join up with former Manchester United legend Steve Bruce who is the manager of Aston Villa. He will join up with fellow loanee Sam Johnstone and other ex-Reds: James Chester and Ritchie De Laet. Goalkeeper Johnstone is playing well for in-form Villa, having kept 12 clean sheets in his 28 Championship appearances so far this season. Tuanzebe could join up with the likes of Chester and De Laet in their defence, which also includes the experienced John Terry. Aston Villa are currently the in-form team in the Championship and many expect them to join Wolverhampton Wanderers in gaining automatic promotion to the Premier League. 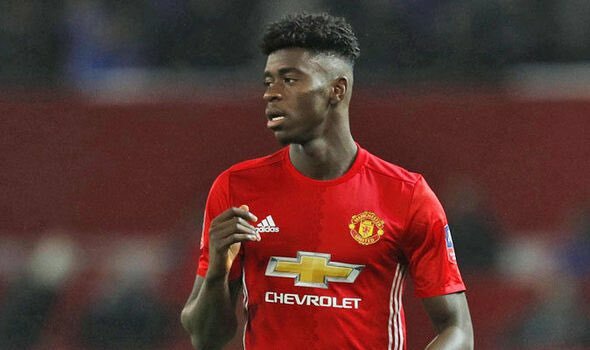 “Tuanzebe is a very good player that is not having lots of possibilities to play here. Hopefully Axel Tuanzebe will be a regular for Aston Villa for the remainder of the season and return to Manchester United with more experience under his belt for the start of our 2018-19 campaign. Previous Article← 4-2-3-1: Man Utd predicted XI to face Yeovil – does Sanchez start?